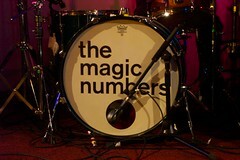 The Magic Numbers are to play Cecil Sharp House, home of the English Folk Dance & Song Society on 5th August. Capacity is very limited and you're not likely to be able to see The Magic Numbers in venues like this for a while, so get in there quick. The Numbers' album was a little too polished and over-produced for us, but we absolutely love the live version of them. If you're one of those who bought the album but wondered why there was so much fuss, you really do need to get along to a gig to experience the true Numbers. Tickets are available via Seetickets, priced at £12.50 each, inclusive of booking fee, but not including the £1.75 for postage on each order. Many thanks to Pollo for the tip.